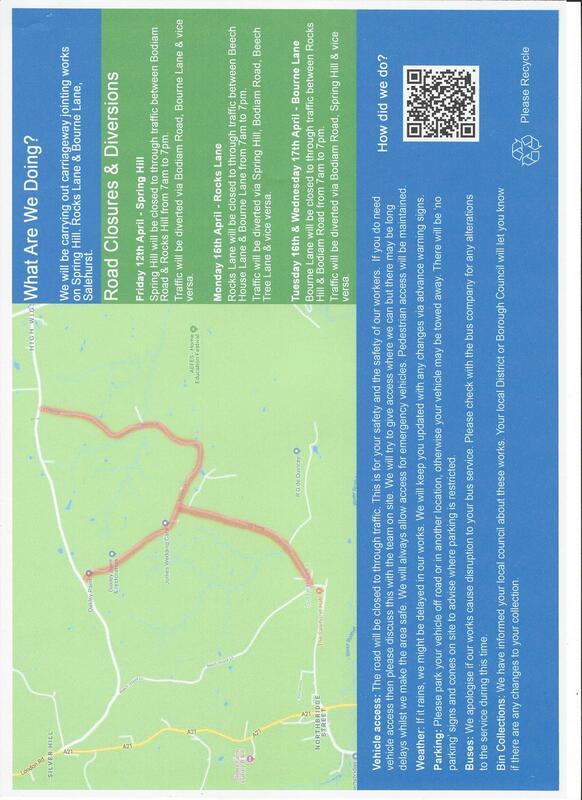 Road works in Salehurst starting tomorrow 12 April - Spring Hill (Friday) Rocks Lane (Monday) & Bourne Lane. (Tuesday and Wednesday). Traffic diversions via Bodiam Road. Rother District Council has published the details of persons nominated for the Parish Council in the Elections on 2nd May 2019. As there were only six nominations for the nine places, all six people have been elected without a contest. This means there will be no Parish Council ballot on 2nd May. You can see the Notice with details of the six people elected here. The new Council will come into effect at 5 p.m. on Tuesday 7th May 2019, when the current Council retires (the current Chairman, Nick Greenfield will remain in post until the new Council elects a Chairman at its first meeting on 20th May 2019). One of the first tasks of the new Council will be to select three suitable and willing people to co-opt on to the Council to fill the three vacant places resulting from insufficient nominations. Elections for the nine places on the Parish Council are due on 2nd May this year. See the Notice of Election here. All nine seats are up for election. If we only receive nine or less nominations, all of them will be 'elected unopposed' without the need for voting on 2nd May. But if there are more than nine, you will be able to vote for the people you want to become your Parish Councillors. Why not consider standing for the Parish Council? Rother District Council Elections take place on Thursday 2nd May 2019. The Notice of Election can be seen here. Our parish is currently represented by two District Councillors, elected in 2015 to cover three parishes: Salehurst & Robertsbridge, Bodiam and Hurst Green. However, following boundary changes effective this year, we will be voting for just one Councillor to represent Salehurst & Robertsbridge residents on Rother District Council. Please make sure you are registered to vote - the deadline to register is Friday 12th April. For all other key dates, including for postal or proxy votes, please see the Rother District Council website. The Parish Office will close at 4pm on Thursday 20 December and reopen 2pm on Thursday 3rd January. We wish all our residents a Merry Christmas and Happy New Year. There will be a Planning Committee Meeting on Thursday 6th December 2018 at Robertsbridge Youth Centre at 7.30pm. The press and public are welcome to attend and up to 15 minutes will be allowed at the start of the meeting for public comments and questions. The agenda for the meeting will be available on the 'Council Meetings' page three days prior. Click here to see the notice. 11am Sunday 2 December. In response to rainfall overnight, river levels through Burwash, Etchingham and Robertsbridge are rising but are not expected to be out of bank. Property flooding is not expected currently. No further rainfall is forecast today which will allow river levels to start falling later this afternoon. The Environment Agency is closely monitoring the situation - incident response staff are patrolling the area and removing any blockages and debris from the watercourse caused by strong winds. Please, please take care of selves and dogs if out walking whilst water levels are high and make sure young people stay away from the streams and river - flows are very strong in high water situations. There will be a Full Council Meeting on MONDAY 19th November 2018 at Robertsbridge Hall at 7.30pm. The press and public are welcome to attend and up to 15 minutes will be allowed at the start of the meeting for public comments and questions. The agenda for the meeting will be available on the 'Council Meetings' page three days prior to the meeting. This page initially shows the ten most recent news articles in brief. You can use an article's link to view the full story.